Obesimed Forte Duopack Lowered Price Promo 112 capsules order online. Obesimed Forte is a medical device specifically for adults with 10 pounds or more overweight (BMI of +28). Obesimed Forte absorbes within 30 minutes to an hour, hundreds of times its own weight in water. Once the caspule isdissolved, it expands in the stomach and creates a feeling of fullness, thus reducing hunger. 1 to 2 capsules 3 times a day, one hour before meals with at least one glass of water. Do not break the capsule. The effective dose can vary per person and can range from 1 to 2 capsules per dose to the maximum dose of 6 capsules three times a day. The dosage may be increased every 3 days with 1 capsule per meal until the hunger reduces and the need for snacks disappears. Do not take Obesimed Forte longer than 30 days in 1 treatment period. After 4 days, the treatment can be resumed. The product is based on vegetable ingredients: Omtec19 ®, Amylum Solani, OmtecX ®, Hypromellose (E464), titanium dioxide (E171). 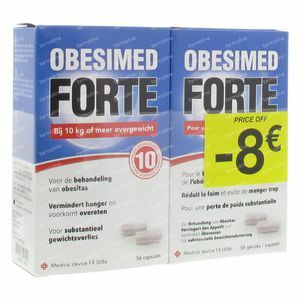 Obesimed Forte is well tolerated but may cause some side effects, although not everybody gets them. In the beginning, mild gastrointestinal symptoms may occur as thin or loose faeces, mild diarrhea, reflux and gas or constipation. These side effects usually disappear after a few days. In order to avoid this side effect, you can start with a low dosage (1 capsule per meal). The dosage can gradually increase, if the body is adapted. If any of the side effects gets serious, or if you notice any side effects not listed here, contact your doctor or pharmacist. During pregnancy or lactation it's not recommended to lose weight, potentially harmful substances from the lipid tissues can end up with the baby. The use of Obesimed ® Forte is not recommended. 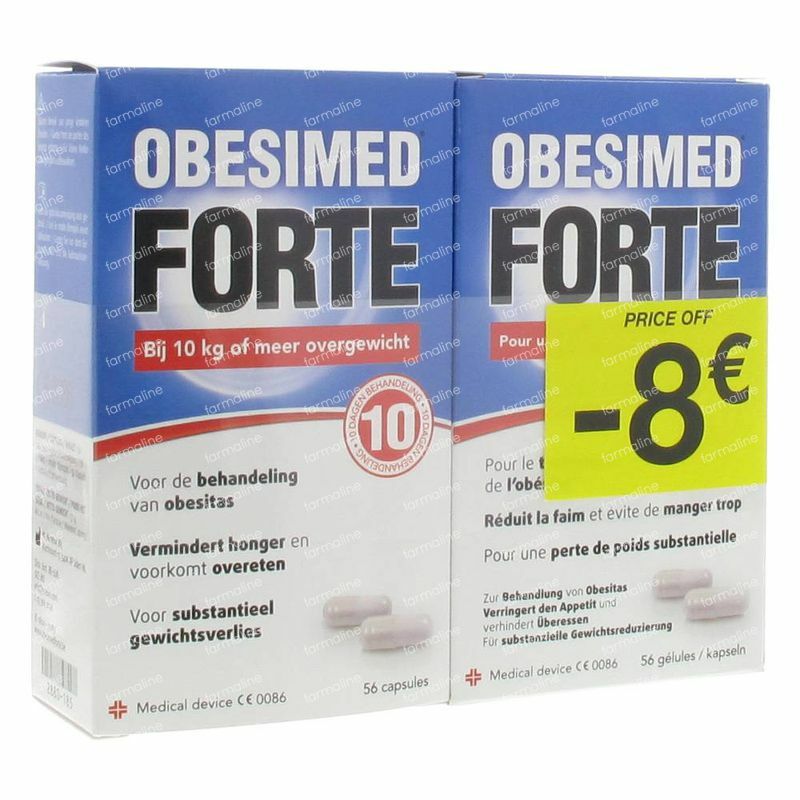 Obesimed ® Forte lowers the glucose levels in the blood. If you have diabetes, it is important to monitor your blood sugar. Talk with your doctor in this case, because your medication may need to be adjusted. The use of Obesimed Forte ® in combination with other dietary supplements or medications that have a hypoglycemic effect is not recommended when there was no consultation with your doctor. Obesimed Forte slows the rate at which food is absorbed and theoretically this could also be done with drugs. Oral medications should be taken 1 or 4 hours after taking Obesimed Forte. Talk to your doctor or pharmacist if you are taking medicines, before using Obesimed Forte. While losing weight and using Obesimed Forte you need to take daily a multivitamin- und mineral preparation. Obesimed Forte can reduce the absorption of some vitamins and minerals in the body. Take the vitamin- and mineralpreparation, preferably before going to bed, to make sure that the vitamins and minerals are well absorbed. This product didn't work for me and after finishing the first box, I cannot see any result. I suppose that the reason was that I don't have set hours for lunch and dinner and therefore was unable to take the tablets an hour before my meal. I wouldn't recommend it to people with busy lifestyles and who cannot commit to take the tablets strictly one hour before eating.